Fearless, the new ITV series starting on Monday, draws on the tense relationship between Suffolk and London locations to express the lead character’s complicated psyche. In the show, London-based solicitor Emma has spent her early career in Suffolk. Now, she is convinced her client has been wrongly convicted for the murder of a Suffolk school girl. 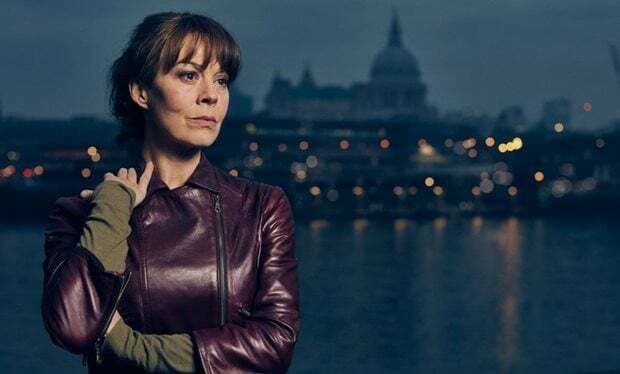 Helen McCrory stars in the drama inspired by real-life lawyers Gareth Peirce and Helena Kennedy, renowned for their unflinching dedication to clients’ causes. Take a look at the trailer here. In London, the series filmed in Kingston, Bexley, Haringey, Islington, Southwark, Camden and Lambeth from September to December last year. The exquisite Tudor hall and staircase in Hall Place doubles as the “Masters’ parlour” at King’s College Cambridge where scenes at a drinks function were filmed. Hall Place is a Grade I listed Tudor country house on the banks of the River Cray. It sits on 65 hectares of gardens, including stunning topiary. FilmFixer manages the location. FilmFixer director Andrew Pavord says, “The drinks scene involved 30 extras – on top of 60 cast and crew already there – all of whom could be comfortably accommodated at Hall Place. “The series filmed there for two days in October last year, using one room for hair and makeup, another as a green room, with space outside for tech parking and equipment access through the kitchen. In December last year Finsbury Park played an American airfield with an actor stepping down prop steps, as if from an airplane, into a waiting army vehicle, and driving off. She is flanked by armed soldiers. A plane has been added into the background with CGI in post production. Waterloo plays a key role in the drama, with Emma’s office on Lower Marsh. The production filmed for five days in November last year, including some exteriors where we see Emma addressing a crowd of reporters, and some conversations held while walking along the street. The production made a donation to We Are Waterloo to thank locals for having them. The promotional photo of Helen McRory was taken at Bankside, with the Thames, Blackfriars Bridge and the London cityscape as a backdrop. Burgess Park doubles for the big skies and green fields of rural Suffolk, where two actors talk around a parked car. At Tuke School’s playground, a prison guard walks an unmate out to the exercise yard, where the inmate is attacked by two other prisoners. At Camberwell New Cemetery, a photographer covertly takes photos of a burial, attended by Emma. Later, we see the body being exhumed at night, with a digger depositing earth. Police tape surrounds the area, and a crowd of press is recording the proceedings. Flashes from the press cameras light up the coffin as it is raised from the ground. Kingston saw courtroom scenes filmed at old Surrey County Hall. An MP is living in a loft apartment on Warner Street in Clerkenwell, on the border of Islington and Camden. There’s an attempt on his life that sees armed police moving in. On Wilton Square the production used a handheld camera to film a group of football fans walking through the square. And Islington’s Arlington Square hosted a stunt scene in which a private detective watches a house on a motorbike, then follows the character who leaves. Gordon McArthur, the chair of residents’ group the Arlington Association thanked Fearless for a donation by way of thanks, saying, “Money donated from filming around Arlington Square has been put towards the work of the Arlington Association to green their neighbourhood. “Thanks to six years of community volunteering Arlington Square is now an award-winning example of how communal gardening can bring neighbours together, forge friendships and create a beautiful community space. In the latest national Green Flag Awards the square was voted one of the top ten best parks in the UK. “The square is owned by Islington Council but maintained by the Arlington Association’s volunteer gardeners, who meet every month. In six years they have replenished the beds and borders with many tonnes of compost and planted more than 50,000 bulbs, shrubs, trees and flowering plants. “What was once an unkempt, neglected space with dying rose beds and dry, compacted perimeter borders has been transformed into a much loved place of peace and beauty. The rose beds have been rejuvenated and the borders now burst with notable camellias, magnolias, azaleas, rhododendrons and shade loving plants and bulbs. What was a rubbish dump in the south corner has been replaced by a Community Garden with raised beds of fruit trees and flowers. Earlier this year the AA’s tireless volunteers cleared out the square’s ragged circular beds and filled them with 1,400 new plants. In the six-part series, dedicated solicitor Emma Banville works tirelessly to free her client, coming up against police and the intelligence services in the UK and abroad which are seeking to keep the truth buried. The series’ writer, Patrick Harbinson has said he leapt at the opportunity of a legal series inspired by the work of real-life lawyers like Gareth Peirce and Helena Kennedy.